Save and exchange your experiences with other players. DigitalXP 1.7.2 and 1.7.10 is a fairly simple mod that adds just two new blocks to the game. One block allows us to save the experience and the other allows us to exchange experience with other players. First we have the “XSave Terminal” block, this is the box that allows you to save and accumulate your experience, in order to do not lose when you die. To use this block, do right clickon the block to access the interface that allows us to store and collect the level of XP. And then, we have the “XChange Terminal” block, that you can use to register two players to exchange experience to each other, to do this, do right click on the block and you will access to the interface that lets you add or accept exchange with another player. 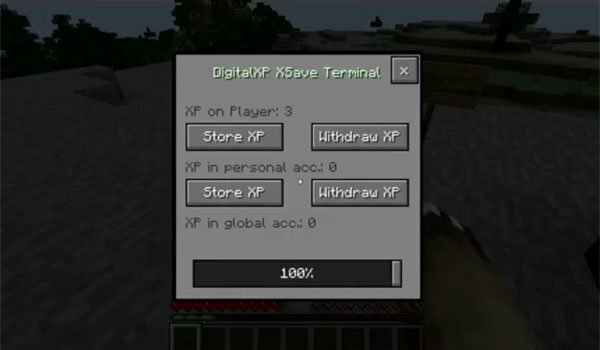 How to install DigitalXP Mod for Minecraft 1.7.2 and 1.7.10? Exchange your experience with other players or just save it!